Girls will fall in love with Fosjoas K2 two-wheel electric self-balancing scooter at the very first sight because of its innovative design concept and high-end appearance. Although two equipped 8-inch Cheng Shin tyres are quite small, they give out a strong sense of power. Truly, they have better trafficability and grip. Thus, they are adaptable to many tough road conditions. Meanwhile, the up-equipped battery also makes it suitable for all weather conditions, including rainy or snowy days. Riders don't need to worry that the battery will be wet any more. What is more, Fosjoas K2 two-wheeled electric scooter also has replaceable battery unit. In other words, if the battery runs out, riders can replace it with a full one, which, actually, lengthens the range infinitely. Fosjoas K2 electric motor is also equipped with an adjustable handle and girls can regulate it according to their height so as to gain the most comfortable riding experience. 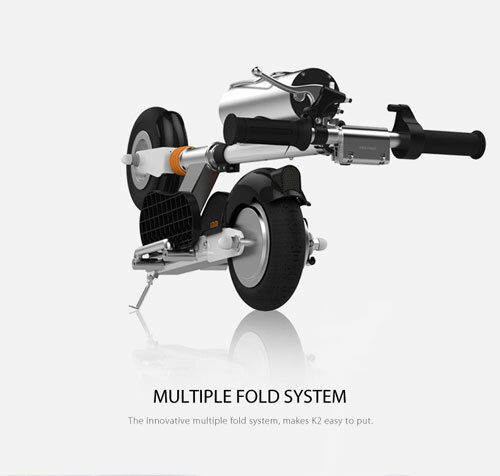 At the same time, Fosjoas K2 electric motor asks for very small parking space because of its multiple fold system. Then, it can be stored in trunk or even in apartment easily. Fashionable appearance, strong driving force, unlimited range and easy storage make girls love it so much that they want to be with it anytime and anywhere. They prefer riding Fosjoas K2 two wheel electric self-balancing scooter to go to school or company to riding a bicycle or driving a private car. After all, traffic jam in rush hours really makes people crazy. They are also willing to ride it to meet good friends and go shopping together. On weekends, they also would like ride it with their boyfriend to enjoy the beautiful nature. By and by, girls will find that their life can't do without Fosjoas K2 scooter like they can't be separated from you.